Communities across the country depend on decades old water reservoirs, ponds, and tanks to store potable water, and in some cases for fire suppression. Although steel and fiberglass are often used for smaller tanks, the largest and most durable outdoor tanks and reservoirs that hold millions of gallons are constructed of concrete or asphalt. Unfortunately, a variety of factors can cause these structures to develop sizable cracks through which large quantities of water can escape (exfiltration) or enter the water supply (infiltration). When this occurs, facility managers must decide whether to demolish and rebuild the aging structure or find a way to extend its service life. Fortunately, advanced polyurea coatings and liners are proving ideal for tank, pond, and reservoir rehabilitation by delivering strong, flexible waterproofing that not only bridges large existing cracks, but can elongate up to 400% without cracking. Cracks can develop in aging concrete reservoirs and tanks for a number of reasons ranging from earth movement to daily or seasonal temperature changes that cause expansion and contraction. The weight of water in a large reservoir or tank can also cause concrete to move several inches. In doing so, tiny cracks in a drained reservoir or tank can open to cracks 1/8″ or larger when filled with water. To address the issue, waterproof coatings such as epoxies are often applied to the surface. However, these traditional coatings lack the flexibility to move and flex with concrete or asphalt and will crack. Instead, water facility managers are turning to polyurea coatings and linings, which are one of the few protective coatings that can stand up to the expansion and contraction cycles of substrates like concrete, asphalt, and steel. Some advanced polyurea coatings not only have high tensile strength, but also the flexibility to elongate 400% and bridge sizable cracks. Redstone Arsenal, a large U.S. Army base in Huntsville, Alabama, had a decision to make: demolish or repair a valuable, working, 5-million-gallon water tank. The tank, built in 1941, has had a useful life as a water storage tank for fire suppression, as well as a back-up drinking water supply. However, the tank had hundreds of cracks and leaks, and was losing water at an appreciable rate. The tank was losing a significant amount of treated drinking water, which is more expensive. The Army base had attempted to use different types of liners over the years, but these were not working sufficiently. Redstone Arsenal’s Public Works Department evaluated their options for more than 10 years with no apparent solution. After the recent success of a polyuria-rehabilitated water storage pond adjacent to the tank, they recognized that they could use a similar approach. The contractor on the pond was also awarded the tank project. A VersaFlex AquaVers 405 pure polyurea coating was chosen due to the potable water requirements. The coating meets NSF/ANSI 61.5 requirements for both cold water (23° C) and high temperature use up to 60 +/- 2° C (140° F), with a superior rating for a 1,000 gallon minimum tank size and no limit on the maximum coating thickness applied. The spray-applied waterproof coating creates a seamless, waterproof, durable protective liner that stops leaks and strengthens the integrity of the entire storage structure. It is designed to withstand decades of freeze-thaw cycling, wide variations of temperature and humidity, and in the late 1990s was issued a 75-year lifespan by Parsons Brinckerhoff on the famed Boston Tunnel Project. With minimal crack repair and surface preparation, the polyurea coating can be thick film-applied directly to the concrete, asphalt, or similar substrate. 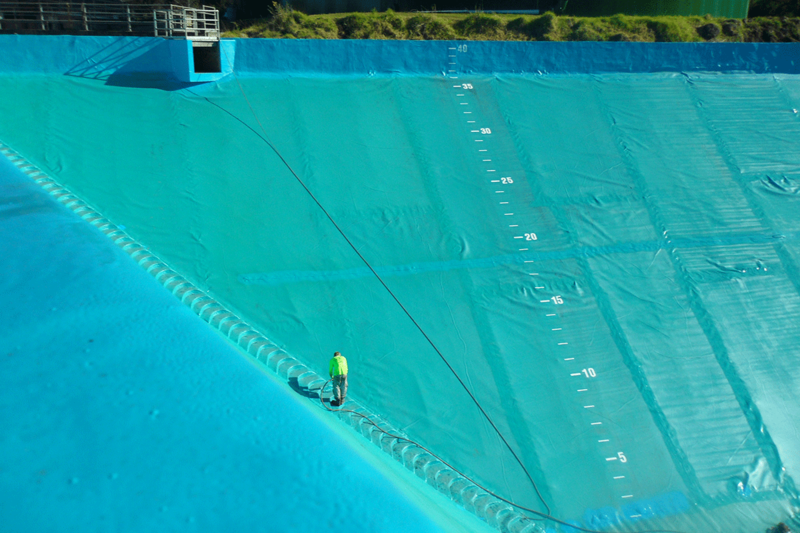 An alternative application method that can sometimes mitigate the need for surface or crack repairs is to pre-spray the polyurea to geotextile fabric panels placed above the onsite substrate, fusing the panel edges together with more polyurea. With either method of application, the polyurea coatings exhibit superior physical properties such as high elongation, crack bridging, hardness, and tensile strength to create a robust industrial liner that protects, strengthens, and waterproofs concrete reservoirs and tanks. Because of the polyurea’s ability to set and cure quickly, it also minimizes water tank or reservoir downtime. This can translate into thousands of dollars per hour savings in facilities requiring potable water and a source of emergency water for fire protection. The polyurea sets up in seconds and can be put back into service as fast as an hour. It can take days for epoxy to cure enough to do the same. The time saved can provide tremendous savings to a facility. After repairing all cracks over 1/8″ wide with a concrete repair grout, the contractor primed the concrete surfaces of the 5-million-gallon water tank with primer, and applied 80-100 mils of pure polyurea. The walls were completed first. Next they removed the heavy equipment from the floor. The tank base was re-cleaned and primed before the final application of the polyurea was applied to the floor. From start to completion, the project lasted two months. Two years later, both Redstone Arsenal’s polyuria-rehabilitated 5-million-gallon water tank and the water storage pond adjacent to the tank have been inspected and remain in excellent shape, with decades of extended life expected. When the Maui Water Department’s Olinda Water Treatment Facility in Maui, Hawaii sought reservoir rehabilitation to stop potable water leakage, the challenge was doing so cost effectively. The 8.5-million-gallon, 60,000 sq. ft., 40′ deep, concrete, Olinda water reservoir was up in the mountains, accessible by a rugged gravel road hard to navigate for a cement truck. Because of the condition of the reservoir’s floor, jack hammering old concrete, using a crane to remove it, and pouring new concrete would be difficult and costly. 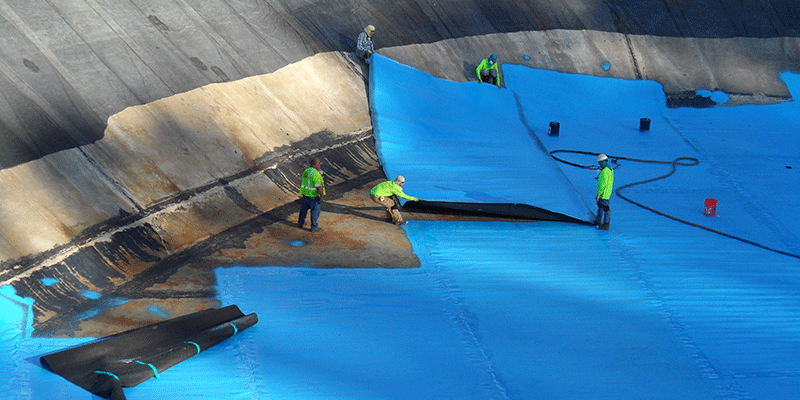 To provide cost-effective, decades­long waterproofing, a full-service restoration contractor used a pre-sprayed composite panel system combining geotextile and a pure polyurea membrane. After removing existing reservoir piping and the synthetic rubber liner from the structure’s floor, a six-man crew installed AquaVers 405 pre­sprayed geotextile at 80 mils to the interior of the reservoir walls up over its rock parapet. The pre-sprayed, 15’x40′, composite panels eased installation by rolling out like a waterproof blanket onsite. Once rolled out, the edges were matched, and the seams sprayed with pure polyurea. The crew mechanically fastened the geotextile to the reservoir walls with stainless termination bars, and then sprayed over the bars. They also sprayed the polyurea on stairs, sumps, and penetrations, and tied these to the geotextile. Despite rain almost everyday, the contractor finished relining the floor and walls of the Olinda reservoir in seven weeks, meeting budget requirements and safeguarding potable water from leakage for decades to come.